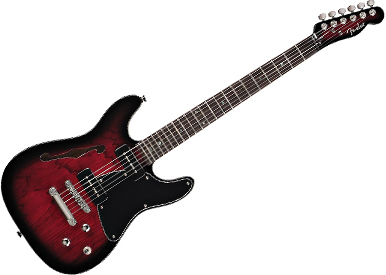 The type of guitar that you choose will depend on the style of music that you wish to play on your instrument. 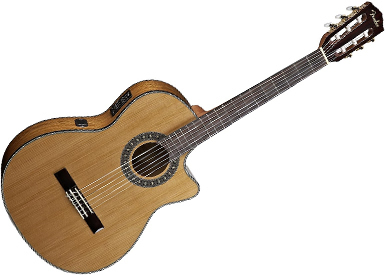 It does not really matter if you decide to learn to play on the electric or acoustic, it is really up to you, but one consideration to make is if you wish to play both styles of guitar, it is probably best to start with an acoustic steel string guitar. Playing this type of guitar will strengthen your fingers as you press down on the strings to make chord shapes. Pressing down strings on the electric guitar is easier and requires less finger strength, so if you wish to play both types of guitar, start with the acoustic. If you plan to play the classical guitar you will find that most classical guitar music is composed for the nylon stringed acoustic guitar. 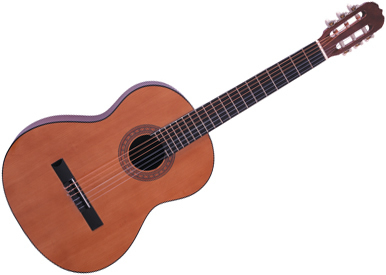 Spanish guitar and flamenco is also most commonly played on the nylon stringed guitar. The main difference between this type of guitar and other acoustics, is the width of the neck. 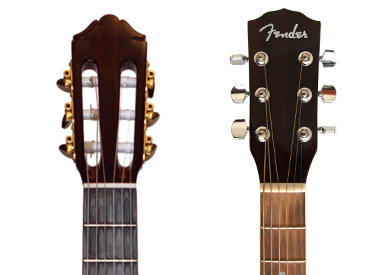 The neck of the classical acoustic is wider than other members of the guitar family. Steel stringed acoustic guitars are played across the widest variety of music imaginable. 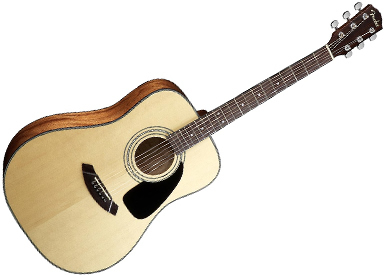 The steel stringed acoustic guitar is a great place to start your musical journey. The sound created from the steel strings is generally louder than that of nylon strings, and because of this it is a favourite guitar of those who just want to stand up at any time to play and sing! Electro-acoustic guitars are the halfway house between the acoustic and the electric guitar. In most cases the electro-acoustic guitar looks the same as the steel stringed acoustic, the key difference is that the electro-acoustic can be plugged into an amplifier. Elecrto-acoustic guitars are fitted with an electronic device that captures the vibration of the strings allowing the guitar's sound to be amplified. This device is called a pickup. The pickup means that the guitarist has greater freedom to move around than if a microphone was pointed at an acoustic only guitar. If you are planning to perform your music in public a electro-acoustic could be a good choice. Electro-acoustic guitars are usually more expensive than regular steel string guitars. All guitarists will remember the first time they plugged in and played an electric guitar - it is an awesome experience! 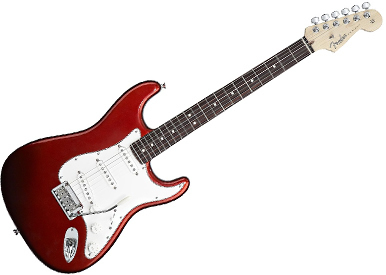 Most beginner guitarists can't wait to get their hands on an electric guitar. 1. They are solid body guitars. The guitar's body is made from solid wood. 2. They must be amplified electronically to hear their sound. This is done using an amplifier usually connected to the guitar with a guitar lead. A guitar lead is basically a long wire with a jack plug on either end. Electric guitars can be quite expensive guitars to own. The guitar itself can be picked up at a reasonable price second hand but there is so much more to buy. The basics are an amplifier and lead, but the list of equipment that you could buy is almost endless. If you do decide to purchase an electric guitar you will need to buy an amplifier. The first type of amplifier that you should consider buying is a "practice amp". This is a small amplifier that will allow you to play at a low volume. Larger amplifiers are often quite loud even on the lowest volume settings, and are not always suitable for playing at home. Consider buying a practice amp with a head phone socket so that you can turn up the volume without annoying the neighbours. On a serious note, watch the volume - you can easily damage your hearing with an electric guitar, many professional guitarists wear ear plugs. Another consideration to be made when purchasing a practice amp is does it have any inbuilt effects available? Effects change the sound that your guitar makes. This makes the guitar's sound more spacious, as though it is reverberating around a large room or hall. This effect distorts the sound wave created by the guitar. This effect is used a lot in heavier rock. This creates an echo of your notes as they are played. This effect makes the guitar sound as though it is playing as part of a chorus, i.e. there is more than one guitar giving a fuller sound. It is probably a good idea to go for an amplifier that has at least reverb built in. Visit your local guitar shop to get a better idea of what is available.